Ok I am going to start using a air brush for the wall art I do. Question is what paint do you guys use and where do you get it. I use wicked paints there made for metal and I buy them from Hobby Lobby the bottles are small but they go a long way, don't forget the performance reducer it allows you to thin the paints and do more of a translucent affect, always start with your lightest colors and go darker. I also use Wicked paints. You can purchase them on amazon in kits of many colors at reduced prices. They are offered in 69 different opaque, translucent, pearls and fluorescent colors which can be mixed to create many, many more colors. The kit I purchased came with a color wheel which shows you what to mix to get different colors. I have had great success with them. Another question with the Wicked paints are you using them right out of the bottle or are you thinning them before. If so what is the ratio 1 to 1 or 3 paint 1 reducer??? thanks Rons for the reply just want to get started on the right foot. This is all wicked paints, Moss Green, Burnt Orange, White and Black with mixing of the colors, check out the cuts on the engine compartment 1/16" in between. I cut my paint by 25% with reducer when using in my airbrush set up for wider spray pattern. If you use a finer tip needle for fine detail you may need to reduce more. Start playing with it and you will pick it up quickly. All airbrushes are different depending on what size tip and needle it's using. Have fun and let us know how it goes. Love the old Model AA. Did you purchase that file or trace it? My son has the real thing that he plans on restoring. I'd like to cut one for him. I use enamel paints from Hobby shops and Krylon enamel in the small bottles from the hardware stores. Use odorless mineral spirits to thin the paint. I use a nose/mouth filter mask in my sealed & air evacuated paint booth room in the basement. I clear over the top with a Krylon clear. Results have been very good. Here is a project I recently did but not yet finished the clear top coat. Basecoat was powder coated white. About 36" tall. 16ga CR steel. 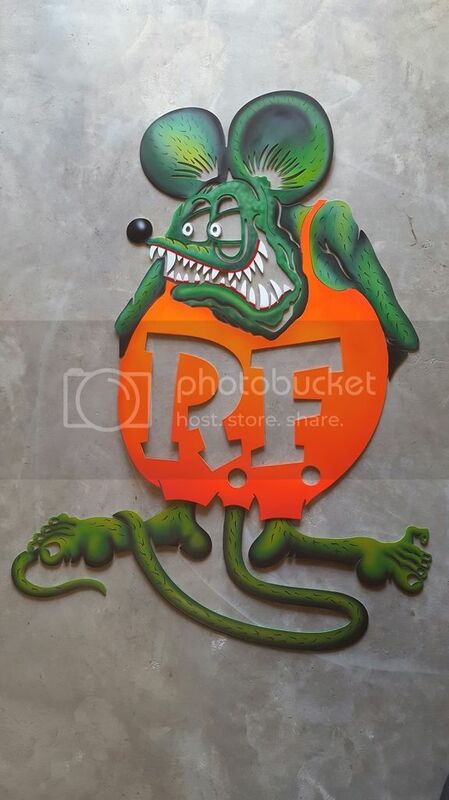 Dude, that Rat Fink is killer! Nice job!